Yeah, but: I'm nothing if not timely - they're on to version 2.0 by now. 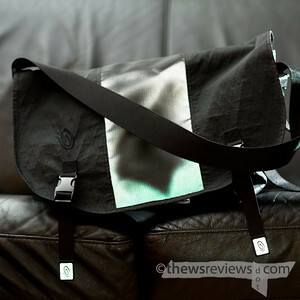 The Long Version: While I love my large T2 messenger bag, it's, well, large. My plan was to use my Seal Line bag for the summer, but I had come to like the T2's flexibility too much. 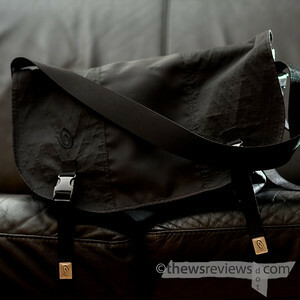 So when I was poking around on the Timbuk2 website and saw that they had a clearance on their all-black Covert messenger bag, I decided to take the plunge. This is the medium-sized bag, and it is significantly smaller than the large size. I do like it when there's a clear difference between products, because it makes the choosing part much easier. This bag is big enough to hold my 800ml water bottle, although the top does poke up a little, along with the other odds and ends that I like to have with me. There's a thermal bag that will hold three cans of coke and a large ice pack, a novel or slim textbook, a camera up to the size of a D700, and a small towel that I carry with me. Allegedly it's to protect the camera and absorb any condensation or water that sneaks in, but really I just always need to know where my towel is. The big deal about the Covert bags is that the centre panel hides an effective reflector that's wrapped all the way around the bag. It only lights up when a direct light hits it, and has just a subtle sheen to it the rest of the time. The current Covert design has added the 'matrix' fabric that includes some reflective threads in the weave for all-around effectiveness. I'm a big fan of being visible to drivers at night, but generally wear dark colours, so this is a perfect fit for me. Sometimes I'll even wear it mostly-empty when I'm biking at night just for the added visibility and extra place to put a rear LED flasher. Not too shabby. Of all of my various bags, this is the one that I use the most. It's large enough to carry what I need, and small enough to hold on my lap when I'm in crowded public transit. It's my favourite non-camera-bag camera carrier, being both (figuratively) bulletproof and unremarkable on the downtown streets. If I could only have one of my T2 bags - this or the large-sized custom one - it would be a really hard choice. While messenger bags certainly aren't for everyone, I've been using this one for eight months now and haven't even been tempted by any other designs. For me, that's saying a lot.